THROUGH BUREO’S NET + POSITIVE PROGRAM, THE PROFITS OBTAINED FROM THE SALE OF NEW RECYCLED PRODUCTS ARE USED TO FINANCE VARIOUS SOCIAL INITIATIVES, SUCH AS ENVIRONMENTAL EDUCATION IN ELEMENTARY SCHOOLS. Satlink, a Spanish engineering company specializing in satellite telecommunications, has reaffirmed at the Our Ocean 2018 Conference, held this week in Bali, its commitment to Bureo Net + Positive program for the removal and recycling of 100,000 kilos of plastic form of the fishing nets used by the commercial and artisan fleets that operate in Chilean waters. Satlink aims to achieve this goal by the end of 2019, through the ‘Impact Zero’ campaign, launched last May with the collaboration of the NGO World Animal Protection and Bureo. 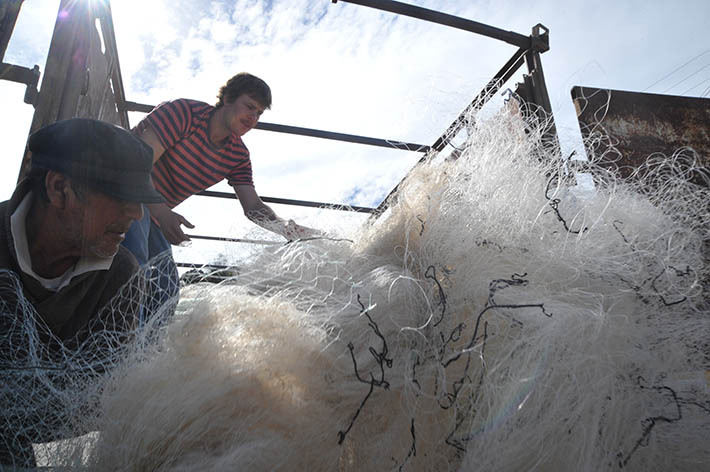 Since then, ‘Impacto Cero’ has already managed to collect 16,000 kilos of fishing nets. In addition to avoiding its impact on the marine environment, the Net + Positive program involves the transformation of the material collected into new products through its recycling, which allows creating jobs in local populations. Likewise, the benefits obtained by Bureo from recycled materials are used to finance various social initiatives. So far, two environmental education projects have already been carried out in primary schools, including the installation in these centers of containers for waste collection. With the aim of reaching 100,000 kilos in 2019, the campaign will be extended this year to four artisanal fishing communities, specifically, Pichilemu, Bucalemu, Llico and Coliumo. Satlink, Bureo and World Animal Protection are members of the Global Ghost Gear Initiative, an organization dedicated to applying innovative solutions to the problem of lost and abandoned fishing networks around the world. Satlink is currently the leading provider of satellite telecommunications systems for the fishing industry. In collaboration with fleets, NGOs and governments, the company develops solutions to guarantee a sustainable fishing activity, such as the electronic onboard newspaper (DEA), electronic monitoring systems or smart buoys. In 2017, Satlink participated for the first time in the Our Ocean Conference which, since 2014, focuses on the presentation of commitments and the adoption of measures to contribute to the protection and sustainability of the oceans, in terms of marine pollution, marine areas protected, maritime security, sustainable blue economy, fisheries management and climate change. In the 2017 edition, held in Malta, the company announced the commitment to improve its electronic monitoring solutions on board in 2020.